The Sydney suburb of 'The Rocks' - established shortly after the European arrival in 1788. Prior to this it was home to the Cadigal people, and known as Tallawoladah. These are the Argyle Stairs, Argyle St. Constructed 1911-1912, during the realignment of Gloucester and Cumberland Streets. Above is the rear of the Glenmore Hotel on Cumberland Street. 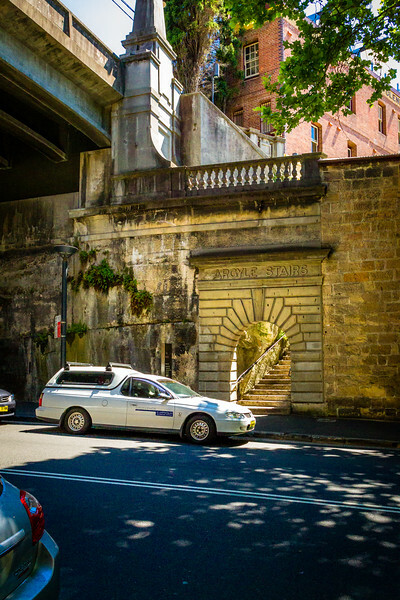 Originally constructed on the other side of Cumberland Street in the 1880s, it was moved to its present location in 1921 (to make way for the construction of the Sydney Harbour Bridge).